Here Is Your Chance To Own A Piece Of The Country. 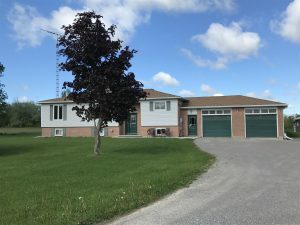 Located Just Off Highway 7 For Easy Commute This Raised Bungalow Is Located On A 1.98 Acre Lot. Open Concept Kitchen, Dining & Living Room With Walkout To Newer Large Rear Deck Over Looking The Backyard & Countryside. 3 Main Floor Bedrooms. 4pc Bath With Jet Tub & Heated Ceramic Floor. Lower Level Has Plenty Of Storage Options. A Large L Shaped Rec Room With Propane Fireplace. A Lower Level Bedroom & A 3pc Bath. Plenty Of Room For A Family!! This Property Also Boasts A 20 x 30 Heated Workshop With 20 x 12 Lean-To, Double Attached Garage & An Abundance Of Parking For Guests, RV’s Etc. Many Updates Have Been Completed Already!